This list of Pseudo-Isidore’s sources is incomplete and expands only with the in-progress edition. Aachen 836. The 836 Council of Aachen, ed. Albert Werminghoff, MGH Conc. 2.2 (Hannover, 1908), 704-67. Scholars doubt that Pseudo-Isidore knew or used the acts of Aachen 836. Heinen, “Pseudoisidor auf dem Konzil” and Schmitz, “Synode von Aachen,” hold that he only had access to the sources of the Aachen legislation, such as works by (or assembled by) Jonas of Orléans and the legislation of the 829 Council of Paris. My apparatus fontium nevertheless cites Aachen 836 in those very few cases where it offers the strongest verbal parallels. Cel. I, JK 382. A decretal of Pope Celestine I (d. 432), known to Pseudo-Isidore via his own Hispana Gallica Corbeiensis (or the interpolated Hispana). Cited here according to Annette Grabowsky’s transcription of Vat. lat. 1341. Const. Sylv. The Contitutum Sylvestri, ed. Eckard Wirbelauer, Zwei Päpste in Rom: Der Konflikt zwischen Laurentius und Symmachus (498-514) (Munich, 1993), 228-247. This is the only one of the Symmachian forgeries exploited in the False Decretals, and the question of Pseudo-Isidore’s specific source is important but unclear. The Symmachian forgeries are sprinkled across early medieval canonical collections, including copies of the Dionysio-Hadriana, the Hadriana Aucta, and the Collectio Sanblasiana. Two copies of the Constitutum Sylvestri have Corbie connections. One, in Paris, Bibl. n. de France Ms. lat. 2796 (the so-called Collectio Bigotiana) falls in the midst of a collection derived from canonical source at Corbie. The other is in a manuscript copied at Corbie, namely Paris, Ms. lat. 3836 (a witness to the Collectio Sanblasiana). Jonas, De inst. reg. Jonas of Orléans, De institutione regia. Ed. Alain Dubreucq, Le métier de roi, Sources Chrétiennes 407 (Paris, 1995). Whether Pseudo-Isidore knew the De institutione regia is uncertain. If he did, the manuscript he used either does not survive or has not been discovered. The earliest extant (partial) copy of this work survives in Paris, BnF Ms. nouv. acq. lat. 1632, from the tenth century but descending, perhaps directly, from an archetype assembled in the 830s. The Latin Vulgate Bible, cited here unless otherwise noted according to the convenient Stuttgart edition: Biblia Sacra iuxta Vulgatam Versionem, ed. Bonifatius Fischer, Johann Gribomont, H.F.D Sparks, and W. Thiele (Stuttgart, 1975). For more on Pseudo-Isidore’s peculiar text of, and sources for, specific biblical books, watch this space. Leo I, Tract. Pope Leo I, Tractatus septem et nonaginta (i.e., Leo’s sermons), ed. Antoine Chavasse, Corpus Christianorum Series Latina 138-138A (Turnhout, 1973). So far I have only identified a citation of one Leonine sermon–sermon 42–in the False Decretals. Pseudo-Isidore’s specific source for the text is a complex matter, as no. 42 was transmitted in many homiliaries and other collections, including the Homiliary of Paul the Deacon. Lib pont. 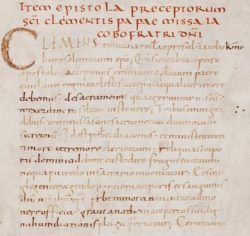 The Liber Pontificalis, ed. Theodor Mommsen, MGH Gesta Pontificum Romanorum 1.1 (Berlin, 1898). The problem of Pseudo-Isidore’s specific source for the Liber pontificalis requires further investigation. If the monastery of Corbie had a copy it does not survive. Sextus, Sent. The Sentences of Sextus, ed. Henry Chadwick (Cambridge, 1959). These ancient, Christianized Pythagorean aphorisms, available to Pseudo-Isidore in the Latin translation of Rufinus, were erroneously ascribed to Pope Sixtus I (d. 128) by the medieval manuscript tradition. Doubtless this spurred the interest of our forgers. Pseudo-Isidore’s specific source for the Sentences was possibly Paris, Bibliothèque nationale de France, Ms. lat. 12205, a sixth-century Italian codex at Corbie by the eighth century. Unfortunately, the folios carrying the Sentences have been lost (see Ganz, Corbie, 126-7). There is nothing to suggest that Pseudo-Isidore used any of three other extant early medieval witnesses (Paris, BnF Ms. lat. 2676, 10318; or Würzburg, Mp. Th. f. 33). Tol. XI. The Eleventh Council of Toledo, known to Pseudo-Isidore via the Hispana Gallica Corbeiensis (i.e., the interpolated Hispana). Cited here according to the transcription of Annette Grabowsky.